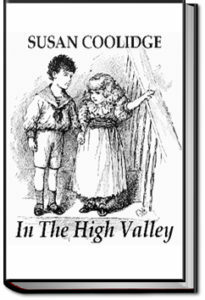 In the High Valley” is the fifth and last book of the popular “What Katy did” series by Susan Coolidge. The story starts out with Lionel Young and his sister, Imogen who set out for the picturesque but remote High Valley (America), leaving their hometown Devonshire (England) behind. Lionel wants to take the share in Geoffrey Templestowe’s cattle business. Imogen, owing to her prejudices against America and the American way of life, finds it hard to adjust to life over there. Clover Templestowe, now happily married and living in the High Valley, at first finds it very trying to get on with Imogen. A lot of events ensure in the course of which we meet again with Rose Red, get news from Cousin Helen and of course meet Katy again… until it all finally ends in a lovely double wedding!